Based on an article written by the author and published in The National Review. In the turmoil and materialism of the US, he sees the beginning of a new civilization which is likely in grandeur and greatness to exceed anything yet known in the civilizations of the Old World. 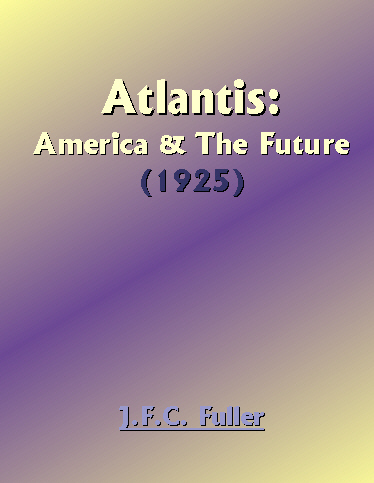 He examines the forces which control the Americans, or the gods of Atlantis as he refers to them, upon whose knees lies the future of the New World, and possibly the Old. Indeed, from the narrow British point of view, if America is to be saved, it is her women who will save her, for they can hold their own with any of their foreign sisters-they are quite wonderful ! A virtue nearly all Americans of the better class possess is hospitality, and especially towards strangers. The American's first greeting is invariably: "Glad to know you," and whether he is glad or not, he, at least, seems so, and goes out of his way to do all he can for you. "The average American is temperamental and insincere, the sentimentality he so frequently displays is but skindeep, for below it lies a good fat layer of brutality." In his opinion, the Englishman possesses more backbone, and is more reliable, but he will not take the risks the American will; he may possess more moral courage, but he is less of a gambler. The Englishman is nothing like so hard a worker as the American, and he is decidedly more hostile to criticism, for tradition is bred in his bone, and by nature he is insular and conservative. The American has few traditions; consequently he is more susceptible to criticism and to change; in fact, he does nothing but change, hence he is more moody than we are. Further, he told me: "The English are creators and inventors, the Americans are not, but they are wonderful improvers and adapters. For brain power, America relies on Europe, but the American is gifted by nature to seize on an invention and turn it into a commercial success. His education is careful but not practical; he is not taught to think, he, consequently, does not know how to express himself. He wanders on for twenty minutes when a couple should suffice. To solidify his ideas he makes use of 'hieroglyphics of speech,' such as 'hot dog' or 'slap-up man 'which convey, in a word or two, the meaning he cannot express in common English." Geography has fashioned the English into an insular race. The smallness of our country, its dense population, and its comparative ease of communications have, in the last half century, turned England into a city-a city of immense suburbs. We all think more or less the same, and we think nationally.